Want to try one of your favorite Starbucks drinks done copycat style? Here is the Starbucks Green Tea Frappuccino. It is the perfect sweet treat with just the right amount of caffeine. Tea lovers rejoice! The Starbucks Green Tea Frappuccino is the best of both worlds – it’s cool and creamy and full of green tea flavor. It’s perfect for a pick me up in the middle of the day or an easy way to treat yourself. Green tea is a mild tea that has far less caffeine than regular tea or coffee. 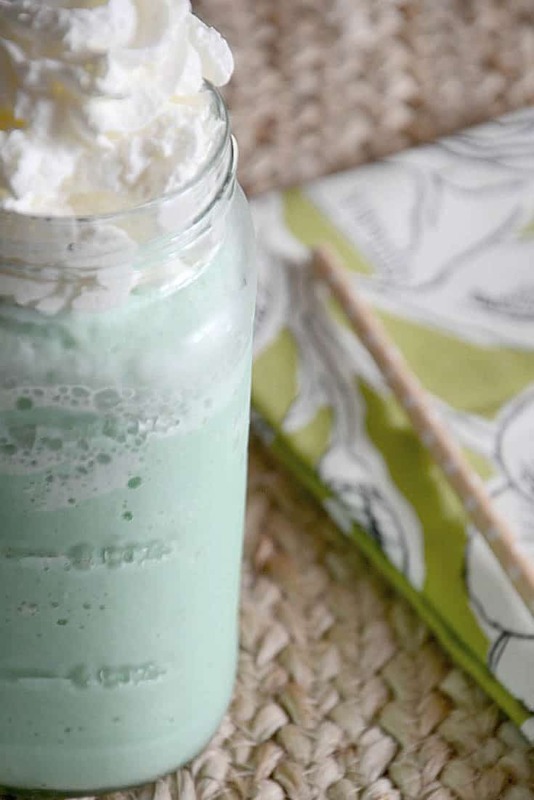 So if you are sensitive to caffeine you may enjoy this green tea frappuccino. For this reason, it is a very popular choice for Starbucks patrons. 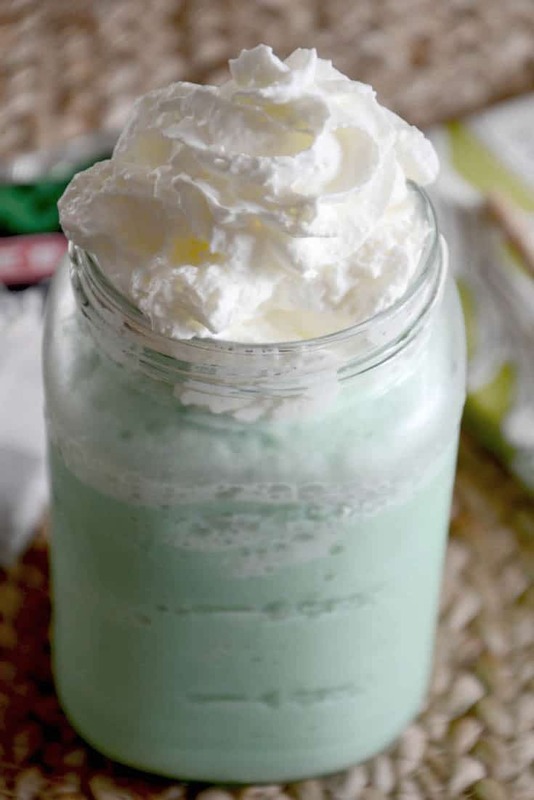 It combines the cream base of a classic Frappuccino with the yummy flavoring of green tea. You may be wondering where the green coloring in the Frappuccino comes from since the tea is a mellow green color. The answer is matcha! Which is a finely ground powder used specifically for green tea. You can normally find matcha in the healthy living section of your local grocery store. The green tea frappuccino is an always a popular choice at Starbucks due to its low caffeine content, fun green coloring, and exotic taste. It may take a sip or two to get used to the flavor but I bet its creamy goodness may make it your new favorite drink! So this may be the perfect treat if you want a treat that is lighter in caffeine. If you don’t want any caffeine you can always enjoy the Starbucks Strawberries Creme Frappuccino. 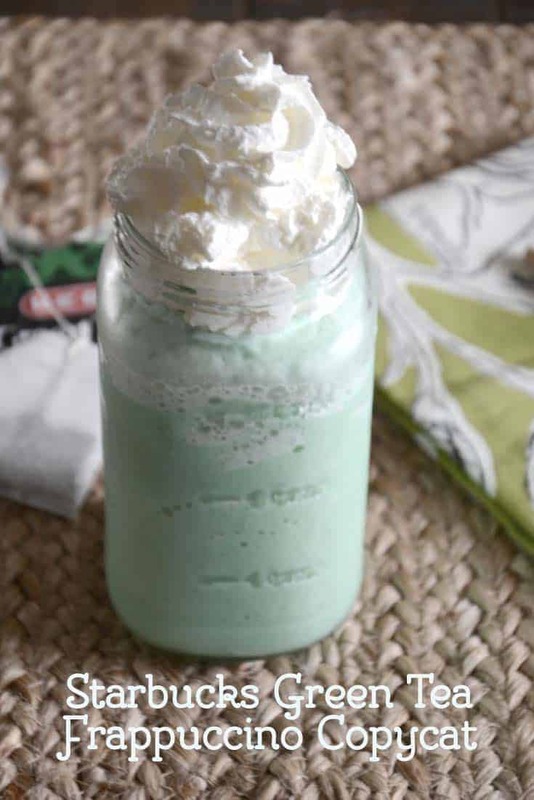 You don't need to leave home to make this Starbucks Green Tea Frappuccino Copycat. In your blender, place all the ingredients in except for the whipped cream. Blend untilsmooth adding more milk or ice as needed. Pour into a glass, top with whipped creamand enjoy! Call me crazy but I have never had a taste of anything when drinking green tea??? What am I missing. I only drink it for health purposes but mine has zero taste! I hope you enjoy the drink! If you’re sensitive to caffeine you should be cautious with matcha powder. The caffeine content in matcha powder is higher than steeped green tea. Where do you buy Match? Will Starbucks sell it? Would you consider doing on on Starbucks’s limited edition Cherry Blossom Frappe? It’s super good, and only available till this coming sunday. (3-20-16). I don’t know :(. I will try to get there. Excellent, give dollars looks better in my pocket! I need to try it! Frapuccinos are my favorite! Love your recipe! This sounds really good to me. I’d like to try it, I haven’t seen it on the menu at Starbucks. I have never had Starbucks products before because they are so pricey. What a great idea to make this yourself, I bet it tastes amazing! I think they are a nice treat to enjoy sometimes. It isn’t an everyday thing for me. I have never had the real thing but this is worth trying. I love the flavor of green tea and the energy that it gives me. I need to try to make this for breakfast. I have spent a ton of money on Starbucks green tea frappuccinos. I’m going to have to try this! Yours is gorgeous! I’m a big fan of a good copycat recipe to create at home. And it will be good for St. Patrick’s Day! I am a Starbucks addict…so I will have to try this. I love your copykat recipes! This one is sure to be a hit at home! All the Starbucks lovers out there are going to flip for this. How fun! There is no green tea in the recipe?? Matcha is green tea. Tea is not made and then put into the drink, you need a more intense flavor. I usually sub the powder for green tea and it tastes the same.